It’s the most important night of the year for costume designer Charlotte Fairfax and the Catskills Shakespeare Theater Company--the annual fund raising performance at the country estate of the wealthy widow Paula Van Dusen. This year, the company will give a moonlight performance of A Midsummer Night’s Dream as part of the wedding celebrations for Paula's daughter, Belinda, and her fiance Adrian. But then Hugh Hedley, family friend of the Van Dusens and Adrian's rival in the cutthroat world of high-end Manhattan real estate, is found murdered with a stolen prop from the play. Paula, desperate to keep her daughter’s name of out of the paper, enlists Charlotte's help, despite the fact that Charlotte's already got her hands full amidst her costume design responsibilities and finding a home for the company's new theater school. But Charlotte nevertheless throws herself into an investigation of shady business deals, a missing dog, and long buried family secrets because "though she be but little, she is fierce!" 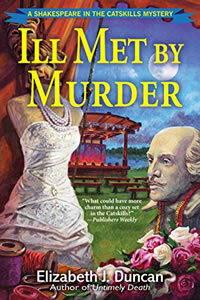 Ill Met by Murder, the second in Elizabeth J. Duncan's compelling mystery series, will satisfy every Shakespeare and mystery lover alike.